In the late ‘90s, collaborators Alfred Uhry (book) and Jason Robert Brown (music and lyrics) created “Parade,” an unlikely Broadway musical based on the tragedy of Leo Frank. The Jewish Frank had moved from New York to Atlanta and married into an assimilated Jewish family only to be arrested for the 1913 murder of a teenage girl who worked under him at his father-in-law’s business. While critics loved the 1998 Lincoln Center premiere of “Parade,” helping it win Drama Desk and N.Y. Drama Critics Circle Awards for Best New Musical and a Tony Award for Original Score, audiences were not so anxious to suffer two-and-a-half hours of Southern inhospitality. A decade later, however, the fearless Irish were ready, willing and able to support Rob Ashford’s staging for the Donmar Warehouse, which opened at L.A.’s Mark Taper Forum on Sunday (where it plays through November 15). The appeal of the Frank story is not that surprising for Uhry and Brown, both of whom have individual shows about Jewish outsiders trying to fit in. Uhry offers a kinder, gentler look at a New Yorker assimilating into Atlanta in 1995’s “Last Night of Ballyhoo,” while Brown used his experience as a teenager thrust into the hinterlands of Indiana high school for “13” (which premiered at the Taper in 2007). For “Parade” they enlisted the input of Harold Prince to move beyond personal history, and comic-drama, and make this shameful tale of anti-Semitism a tragedy of mob mentality that resonates for all Americans. Whatever the percentages, the contributions of Uhry, Brown, Prince, Ashford and the designers have blended into a seamless whole. Brown’s ability to evoke the early 20th Century South, reminiscent of Randy Newman's evocative arrangements, blends with Uhry's careful storytelling to develop and then unravel events at the right pace. Upon Christopher Oram’s set, lit as if by candles under Neil Austin's warm design, and wearing Oram’s beautiful costumes, the cast becomes both reflective chorus and damning crowd for Leo Frank, a man sentenced to hang for the murder of 13-year-old Mary Phagan. For most of the play, the incidents surrounding her death remain just vague enough to leave open the possibility that Frank might have actually done it. The ensemble is wonderful, with outstanding work from T.R. Knight as Frank and Lara Pulver as his wife. Charlotte d’Amboise is splendid as the girl’s mother and the wife of the Georgia governor, played by Michael Berresse. 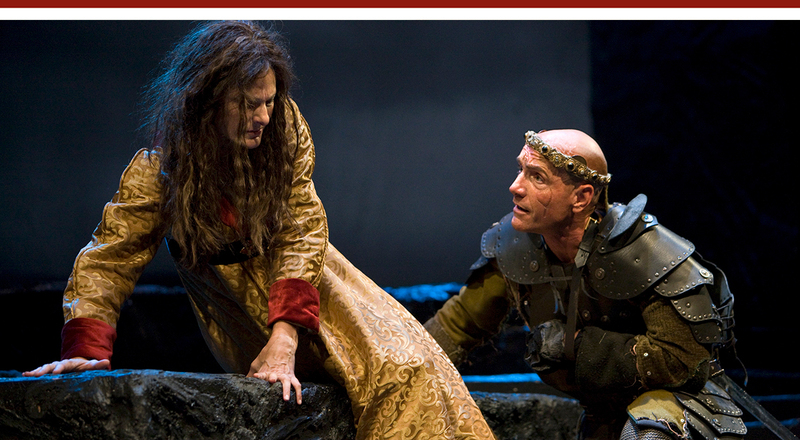 But it is David St. Louis, in three distinctly memorable roles, who gives the musical its most powerful numbers. In “That’s What He Said,” “A Rumblin’ and a Rollin’” (with the excellent Deidrie Knight) and “Blues: Feel the Rain Fall,” he single-handedly gives voice to the African-Americans who were principle victims of this bigotry. In fact, the degree to which anti-Semitism motivated the crowd, the press, and the establishment is minimized here. Frank, the last person to see Phagan alive, is at first a convenient scapegoat. Along the way, the Christian supremacists will emerge from the crowd to take advantage of the situation and attempt to re-route America's slow march towards equality. Ultimately, they provide “Parade" the currency to remind us not to stand on the sidelines when justice gets lost in a crowd. Geoff Elliott’s staging of Shakespeare’s “Richard III,” which opened over the weekend at A Noise Within (in repertory, through December 12, with the upcoming “Crime and Punishment” and “Noises Off”), begins with divine inspiration: a heavenly choir of characters harmonizes a requiem to remind us that British kings were chosen to rule by God. Elliott is asking, If so, what is to be made of the rule of Richard III? Too soon, however, we will be asking ourselves what has been made of the role of Richard III? Beginning Richard's opening “Winter of our discontent” speech at the top of the house left aisle, Steve Weingartner helps position Elliott’s question by putting Richard as far as possible from those angelic singers stacked up on Darcy Scanlin’s layered slate set. Weingartner, who manifests Richard’s deformities with a withered arm in sling and club foot boosted by a lift (which, after disappearing and reappearing should just be abandoned), wisely saves the venting of Richard’s inner monstrosity for key moments. Unfortunately, what often fills in the rest of the time is a glibness that ocassionally includes mugging to the audience. Rather than upping the stakes by expanding the gulf between the man and the monster, he undercuts his own impact with a Richard williing to beseech strangers to laughter. It might work, but it needs to be scarier; more chilling: If Richard is to be a friend, he is one who not only might stab you in the back, he can’t wait to do it. There are moments when the staging shifts to special spotlights that isolate the interior Richard. However, there were enough occasions on opening when Weingartner struggled to work within the light that designer Ken Booth needs to widen them. Elliott has assembled a company of Noise Within regulars, led by the dependable Freddy Douglas, Mitch Edmonds, Bo Foxworth and Deborah Strang. Among the other stand outs are Lenne Klingaman as Anne, Jeremy Rabb as Buckingham, and especially Susan Angelo as Elizabeth. Nikki Delhomme designs the costumes and Patrick Hotchkiss deserves extra credit for a very detailed and well-separated sound design. Ken Merckx, here assisted by Spike Steingasser, adds his usual superior combat choreography. Whether or not the transference of the British line during the last two centuries of the Dark Ages was according to Divine plan, getting a handle on the parties involved is intriguing at best and confusing at worst. Even with a riveting central performance it’s easy to get lost in the players. Unfortunately, the program's family tree contains a couple of errors that might add to the confusion: the son of Edward the Black Prince was Richard II (not III), and Richard, Earl of Cambridge was son of Edmund, Duke of York (hence Richard III was part of the House of York) not Lionel, Duke of Clarence. Better to refer to Noise Within’s excellent Study Guide. The ancient conundrum that “the Tao that can be named is not the true Tao” has a modern application in the Broadway bio-musical: the artist worth recreating cannot be recreated. This growing genre, which has already reincarnated Ray Charles, Ella Fitzgerald, Lena Horne, Hank Williams, Jim Morrison and, most successfully, the Four Seasons, has added Sammy Davis Jr. to the gallery, in composer-lyricist Leslie Bricusse’s Sammy. This in no way demeans the performer who gamely tries to show us what becomes a legend. In “Sammy,” receiving its world premiere at the Old Globe (through November 8), Obba Babatundé is excellent and exciting. Babatundé can act, dance, sing and play drums. But Davis, as Babatundé knows as well as anyone, is more than the sum of his parts. What further limits this part, however, is that “Sammy” is celebrating both Davis and Bricusse. This is the life of Sammy Davis, who died of throat cancer in 1990 at the age of 64, through Bricusse’s music, supplemented by new material he has written specifically for this show. And, if a single songwriter is to hold exclusive title to “Sammy's” music supply, Bricusse is the man. Two of his musicals, both written with Anthony Newley, gave Davis two of his biggest hits: “What Kind of Fool am I?” from “Stop the World – I Want to Get Off” and “The Candy Man” from “Willy Wonka and the Chocolate Factory.” “World” also yielded “For Once in My Life,” another signature tune for Davis, which opens this show. It is Bricusse the bookwriter, however, who creates the biggest problem. Bio-musicals would seem to write themselves. 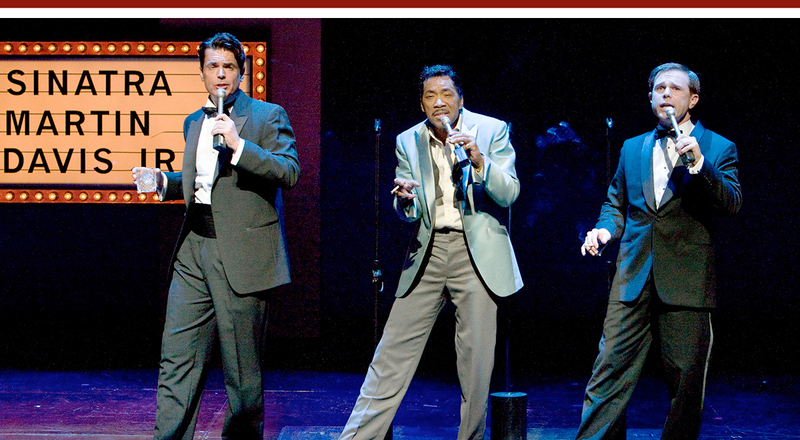 The chronology creates the storyline and the entertainer’s hits provide the musical numbers. But chronology is not drama. Some external pressures must invoked to bend the spine of the story for its dramatic arc. 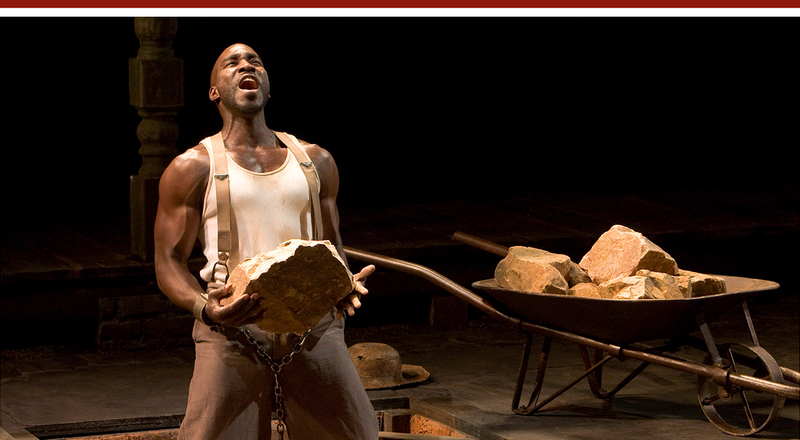 And using a playwright – as “Ray Charles Live” did by hiring Suzann-Lori Parks -- is a good place to start. Bricusse seems to want to bookend “Sammy,” by flashing back to his origins from a 1951 top-of-the-world, post-Oscars performance for the biggest names in Hollywood. After belting out “Lifetime" to this group to open the show, Davis drifts into a personal reflection about his decades in show business, whisking us back (thanks to Alexander Dodge’s versatile set) to the time when he joined his father and uncle onstage at the age of 4. However, we never return to Ciro’s or 1951. That seems to be endemic of Bricusse’ book. We drift from time to time, finding locations for Bricusse’s songs to attach themselves, never really mining the drama that surrounded him. After all, Davis, Charles, Nat King Cole, and others, were not just groundbreaking entertainers. They were point men risking life and limb in a frequently dehumanizing battle to help America free itself of hypocrisy. They may have become rich in the process, but they made a lot of other people rich, too. So, it isn’t for lack of drama – political, cultural, familial – that Bricusse’s book fails to thrill. And, he does manage to touch on them all. It’s just that they aren’t shaped for their best effect. One of the obvious possibilities is the use of Bill Robinson, a dancer who was a pioneer in the generation before Davis (and who gives the closing song “Mr. Bojangles” its bittersweet soul). Were he the gentle spirit, instead of Eddie Cantor, who had a heart-to-heart with Davis, we might be on to something. The cast does what it can, but the moments are episodic. A particular favorite is Adam James, who gets the thankless job of impersonating Frank Sinatra – which virtually every mail recording artist attempted between 1950 and 1960. Despite the seldom-probing script (and the fact that he looks nothing like him), James captures the easy rhythm and spontaneity that characterized this other major talent. For today’s audiences, “Sammy” is Babatundé’s show, and he will deserve every standing ovation he gets during this run. If older folks fail to find in “Sammy” insights into what made Sammy run, it isn’t his fault. After all, it isn’t the songs, the dance steps, or even the tragedy that made Davis great. It was that ineffable something that, as the ancients said, can’t be named. There is serious scholarship behind the comic arm-twisting that propels Evan Smith’s new play, The Savannah Disputation, currently receiving its West Coast premiere at the Old Globe Theatre (through November 1). Kim Rubenstein’s staging taps both the gravity and levity that characterize the eternal face-off between opposing faiths, and her crack quartet of actors helps make this a big feather in a Globe cap that had slipped recently under the shifting weight of some big, less-balanced musicals. 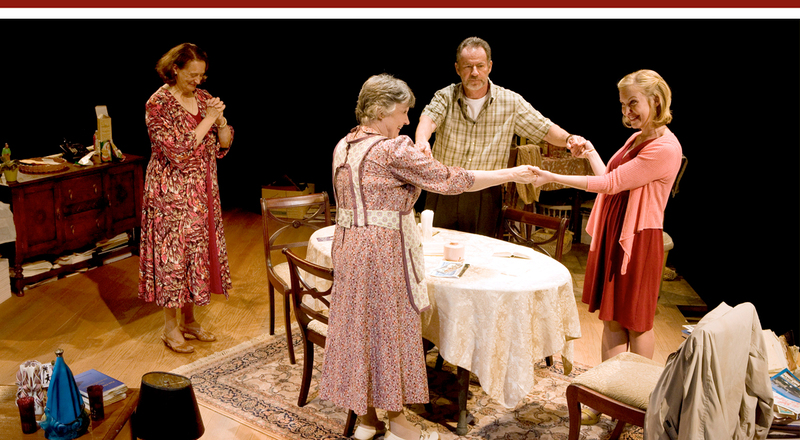 Savannah provides the setting for the kitchen-table showdown between a door-to-door proselytizer named Melissa (Kimberly Parker Green) and Catholic sisters Margaret (Mikel Sarah Lambert) and Mary (Nancy Robinette). Melissa’s evangelical congregation has sent her out to clack doorknockers in search of convertible Catholics. When she happens on Margaret, the older, kindly half of these good-cop/bad-cop sisters, the perky Protestant zeroes in. She leaves literature and promises to return to answer any questions about it. Mary, who wears the prickly bitterness of a long-abandoned wife, returns home, spots one of Melissa’s pamphlets, and orders Margaret to call off the second visit. But Margaret, who never married, believes one's faith should be a conscious choice, embraced because it holds its own against other religions and denominations. Mary, on the other hand, clings to the faith of her father and sees any competing view as an attack. She is surprised when Melissa shows up and even more irate that her sister has not followed her commandment. She immediately goes after the front porch preacher with the squawk and flutter of a barnyard hen. But when her hollow, lip-service understanding of doctrine is shredded by Melissa’s well-researched message, a Bible-based disputing of Catholic fundamentals, she pretends to be interested in learning more, and invites Melissa back – on the evening her parish priest, Father Murphy (James Sutorius), has his weekly meal with the sisters. Murphy and Melissa will arrive unaware of the grudge match. Loneliness is a common theme that Smith uses to connect the four characters. The spinster and her sister, living together because no one else is interested in them, the celibate father, and a young divorcee needing to find someone in the shallow pool of her upstart church. All appear closer to their God than their species. Each actor presents his or her case, each works the material beautifully. Green shifts smoothly from the pretty coed who gets in the door to the tough salesperson out to close the deal. Sutorius wears well Murphy's role as representative of a 2000-year-old tradition. He waits for his moment to make his point, as he has through thousands of confessions. The sisters are nicely drawn, with Robinette having the hardest assignment, creating a hateful woman we don't hate. She does about as well as one can imagine. Deb O’s set is functional if not particularly memorable, but she is hemmed in by the lack of walls and, unlike the Cassius Carter this replaces, no way to drop ceiling pieces, etc. Judith Dolan provides the costumes; Alan Burrett is lighting designer and Paul Peterson contributes the sound. The Savannah Disputation proves as funny as it is well-informed. For those who enjoy their religious perspectives at a secular stage, their faith in the Old Globe will be redoubled by Smith’s rewarding play.